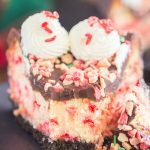 Creamy white chocolate, crushed candy canes, peppermint crunch baking chips, and peppermint chocolate melts all come together in this simple holiday treat! Ready in minutes! I made this in August. In my defense, I was making this Leftover Halloween Candy Chocolate Bark the same day, and figured why not just get this out of the way. I also made this Candy Corn Bark, so it was just a big ol’ candy and chocolate kind of day. I found candy canes at Sam’s Club in August, believe it or not, as well as a plethora of Christmas decorations. It was crazy. 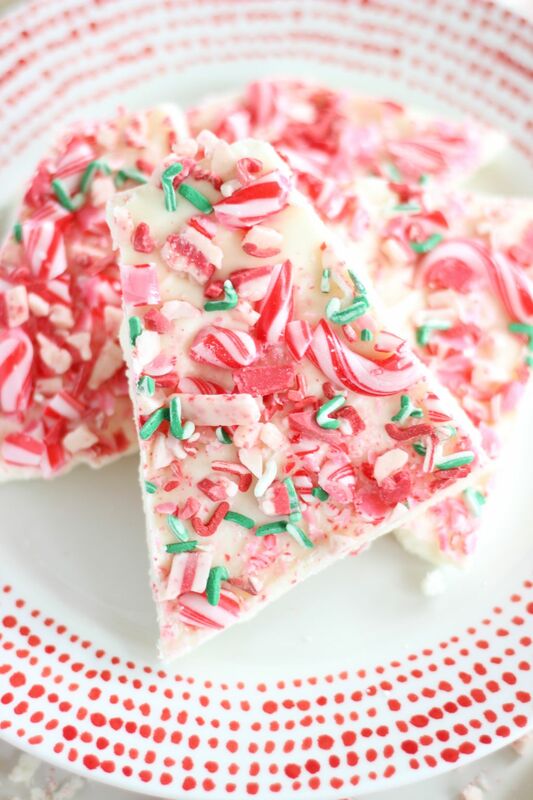 There are so many peppermint bark recipes out there on the internet, and everybody seems to have their own version, but can you ever have too many peppermint bark recipes? I don’t know that this one offers you anything new or different, but it’s something that I wanted to make. If I was making it anyway, I wanted to share it here too. Actually, I take that back. 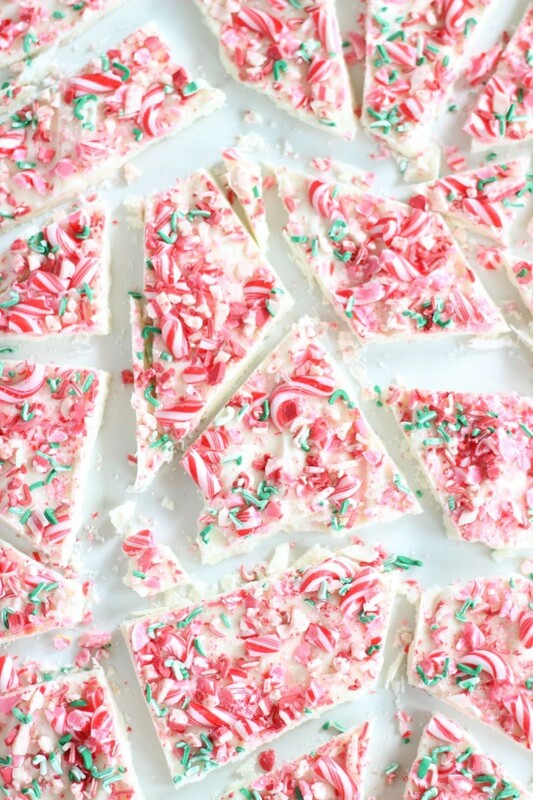 Most just include white chocolate and candy canes, but this includes Wilton Candy Cane melts too, and Andes Peppermint Crunch baking chips. 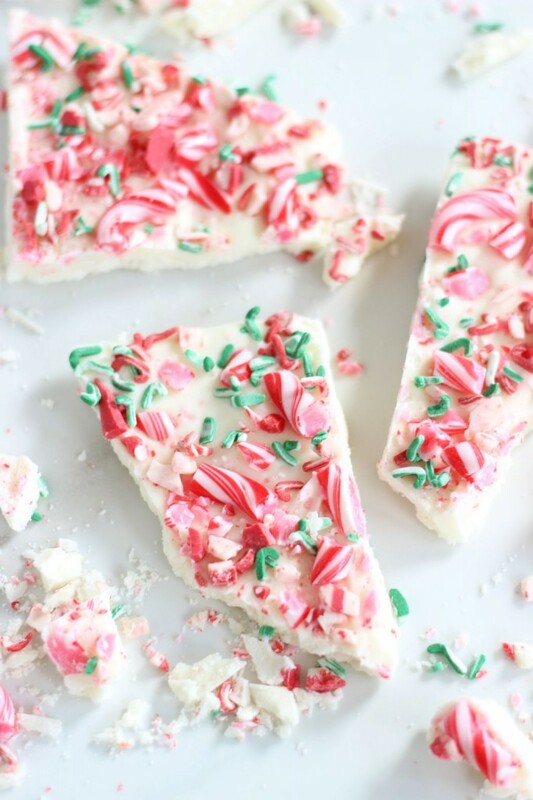 Extra peppermint flair. And it makes a difference. This is a space to share my recipes as well as kitchen adventures, and this was an adventure, indeed. 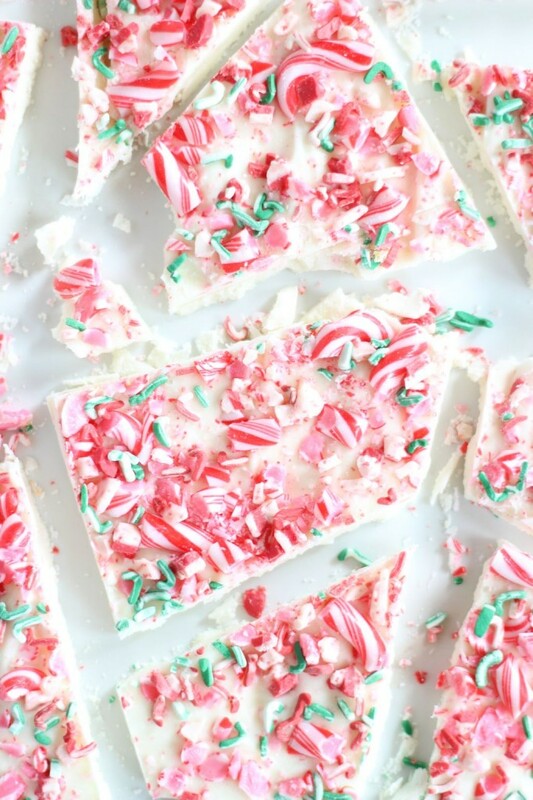 Because, when you’re making peppermint bark in August and you’re sprinkling it with candy cane sprinkles, it feels like an adventure! I wrapped it up and stuck it in the freezer immediately after making it. 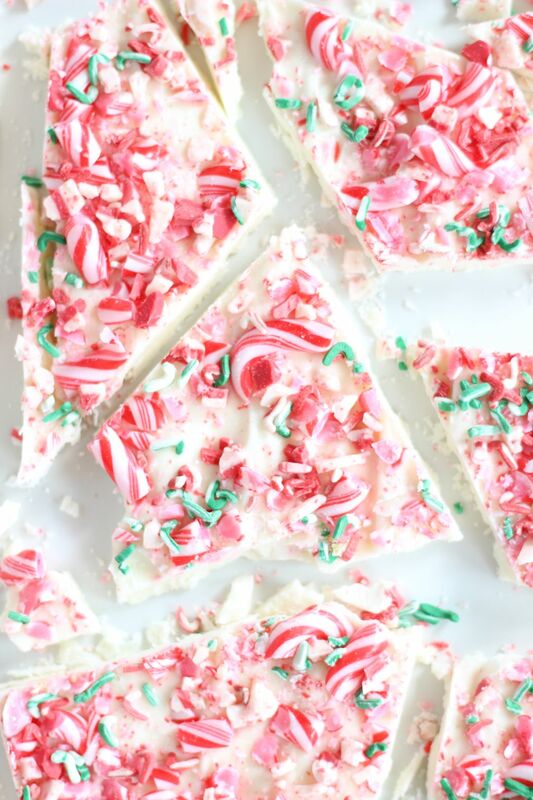 This recipe makes a boatload, and I’ve been eating frozen bits and shards of this Peppermint Candy Cane Bark since summertime! 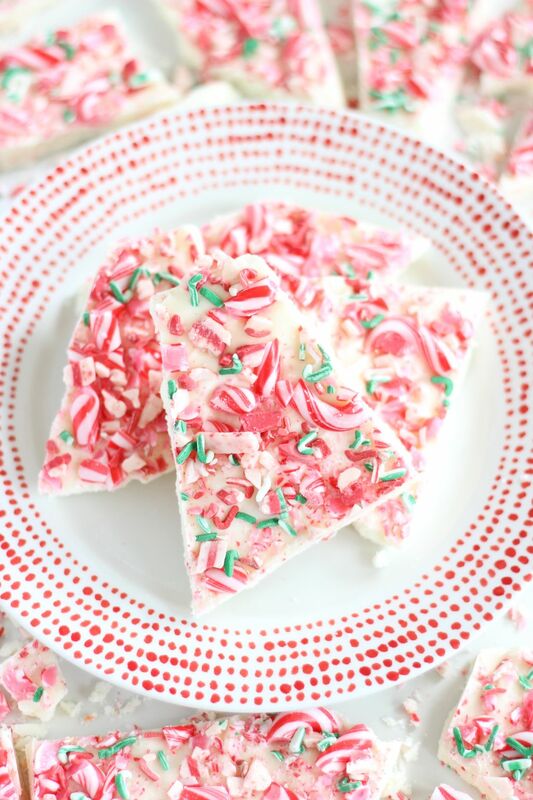 Creamy white chocolate, crushed candy canes, and peppermint crunch baking chips all come together in this super simple and fast holiday candy! 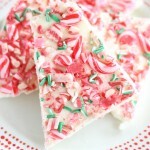 Place the almond bark and Wilton candy cane melts in a large microwave safe bowl. 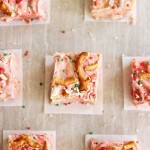 Microwave the almond bark for 1 minutes to start. Stir, then continue microwaving at 30-second intervals until melted and smooth. Stir in 1/2 of the crushed candy canes. 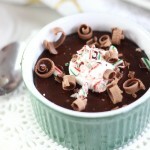 Sprinkle the remaining crushed candy canes and peppermint crunch baking chips evenly over the chocolate. Decorate with sprinkles and/or sanding sugars, if desired. Allow to set completely, and break into pieces. This bark is so pretty, Sarah! I love peppermint flavors around this time of year. It’s so cool and wintery. 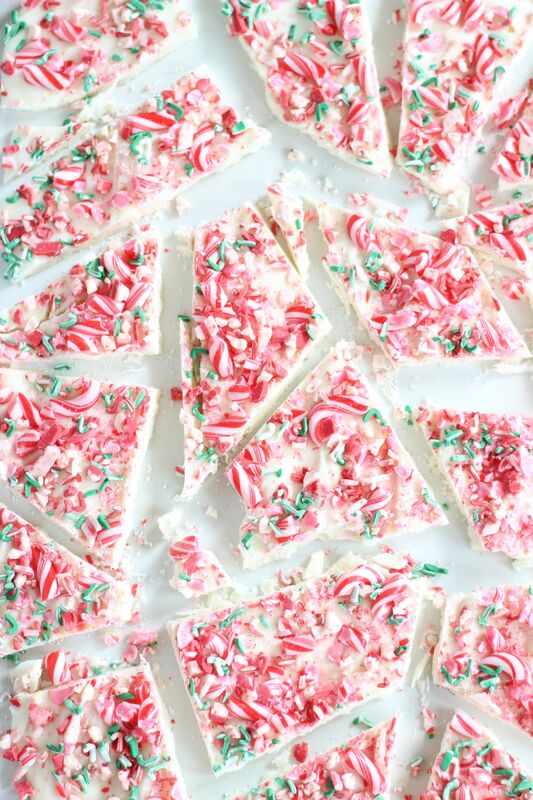 Candy cane bark would make a wonderful holiday gift! That’s true! It really would. I should do that. I just finished eating what we had in the freezer, but it’s so easy to make, so it’s nice that I can make more pretty quickly. Haha! Thanks, Jen! Two words:different and plethora. And you are gorgeous on top of it! 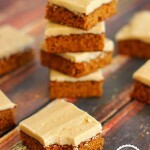 You are right in regards to many bark recipes, also that yours is a tad different. Printed and pinned!! Plethora is just a word I like. Sounds weird, but just flows. PLE THOR A. LOL! 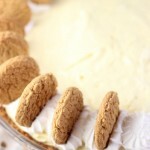 THANKS FOR YHE RECIPE AND HAPPY HOLIDAYS.